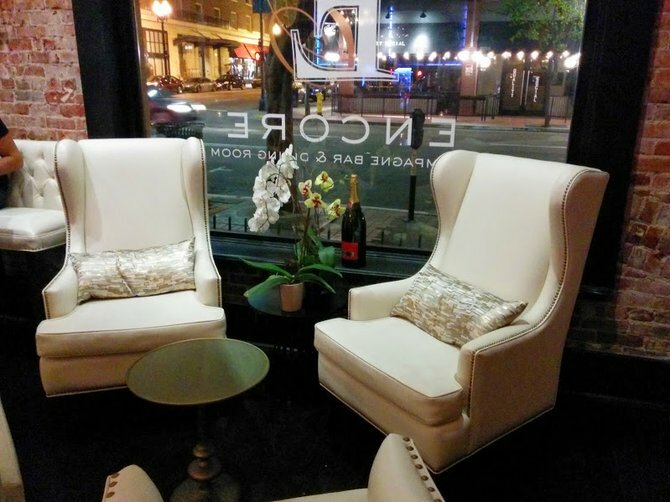 With caviar service, an extensive menu of sparkling wines, and crystals-and-white-leather decor that walks the fine line between cheesy and opulent, Encore sits somewhere between a conventional restaurant and a straight-up bar or nightclub. The late happy hour (11PM-1AM Sunday-Thursday) gives the place an extra bit of value in that it's perfect for a low-key glass of bubbles and a quick snack during off-peak nights. Could be a mob-scene for weekend brunch or drunken weekend nights, but other times it's just right for classy hangout sessions. Sunday 10:30 a.m. to 1:30 a.m.
Monday 11:30 a.m. to 1:30 a.m.
Tuesday 11:30 a.m. to 1:30 a.m.
Wednesday 11:30 a.m. to 1:30 a.m.
Thursday 11:30 a.m. to 1:30 a.m.
Friday 11:30 a.m. to 1:30 a.m.
Saturday 10:30 a.m. to 1:30 a.m.